Hervieux first described the condition kernicterus in 1847, and Schmorl first used the term kernicterus (yellow kern) as early as 1903. Regions in brain most commonly affected include the basal ganglia, hippocampus, geniculate bodies, and cranial nerve nuclei, such as the oculomotor, vestibular, and cochlear. The cerebellum can also be affected. Bilirubin-induced neurologic dysfunction (BIND) refers to the clinical signs associated with bilirubin toxicity (i.e. hypotonia followed by hypertonia and/or opisthotonus or retrocollis) and is typically divided into acute and chronic phases. The two terms are used interchangeably, but this use is not technically accurate because one refers to clinical manifestations and the other to an anatomic diagnosis. The purpose of this document is to discuss overview, clinical management and management of kernicterus. Despite the lack of a clear-cut cause-and-effect relationship between kernicterus and the degree of hyperbilirubinemia, laboratory investigations have demonstrated that bilirubin is neurotoxic at a cellular level. Other in-vitro studies have shown bilirubin to have more antioxidant capability than vitamin E, which is commonly assumed to be the most potent antioxidant in the human system (1). This possible role of bilirubin in early protection against oxidative injury, coupled with identification of multiple neonatal mechanisms to preserve and potentiate bilirubin production, has led to speculation about an as-yet-unrecognized beneficial role for bilirubin in the human neonate. The term kernicterus literally means "yellow kern," with kern indicating the most commonly afflicted region of the brain (i.e. the nuclear region). Historically, the term refers to an anatomic diagnosis made at autopsy based on a characteristic pattern of staining found in babies who had marked hyperbilirubinemia before they died. Conventional wisdom characterizes kernicterus as prevalent in the 1950s and 1960s, virtually eradicated in the 1970s and 1980s, only to reappear during the 1990s (2). It was speculated the early discharge of term infants (before their serum bilirubin concentration peaks) could be a factor in the reemergence of this devastating neurologic affliction, and medical research focused on developing surveillance and treatment paradigms to eliminate the condition. Kernicterus is now recognized in the premature infant, and very rarely, in the term infant in the absence of profound hyperbilirubinemia (3). However, the other problems (e.g. acidosis or infection) are present in term infants without profound hyperbilirubinemia. Conversely, physiologic jaundice (sometimes to levels previously thought to be universally dangerous) has been recognized to be within the reference range in the first week of life in healthy term babies, particularly those who are breastfed. Jaundice of this type is usually spontaneously and resolves without sequelae. The exact incidence of kernicterus is unknown. A pilot kernicterus registry monitoring the cases of babies with kernicterus in the United States who have been voluntarily reported shows 125 babies with chronic kernicterus enrolled in the registry from 1984 – 2002 (4). In this study, all but 4 babies reported in the registry had been discharged from the hospital fewer than 72 hours after birth (97%). Five babies were born at home (4%). No sequelae were identified in 9 of 115 infants, and 1 was lost to follow-up (4). In Denmark, 8 cases of kernicterus were reported from 1994 – 2002, whereas no cases had been reported for the preceding 20 years (5). An overall incidence of kernicterus in Denmark is reported 1.1 in 100,000 live births; in UK surveillance study has reported at a rate of 1 in 100,000 live births; and in Canadian survey published in 2004 assessed the frequency of extreme hyperbilirubinemia as 1:2,840 live births (5). Using these data, the risk of developing kernicterus in infants manifesting hyperbilirubinemia (>25 mg/dL) can be estimated across populations. It should be noted that kernicterus also occurs in infants in whom bilirubin levels remained <25 mg/dL, and the population risk of this occurrence remains unknown. Hispanic and Asian populations appear to have a greater propensity to develop hyperbilirubinemia, although the underlying explanation of this observation remains elusive. Genetic variants, such as Gilbert disease or G6PD deficiency that occur in sequestered populations, result in geographic and/or ethnic differences in the risk and frequency of kernicterus. 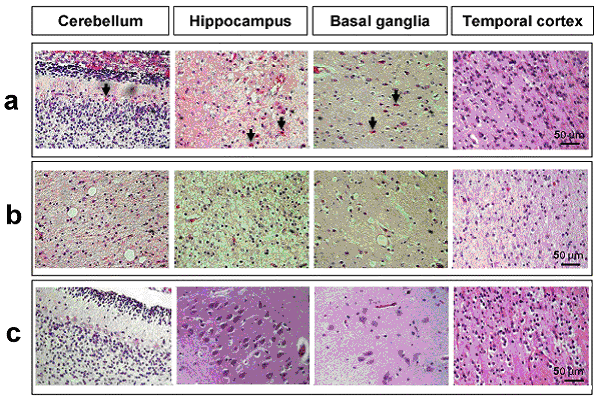 Bilirubin staining can be noted on autopsy of fresh specimens in the regions of the basal ganglia, hippocampus, substantia nigra, and brainstem nuclei. Such staining can occur in the absence of severe hyperbilirubinemia; in this situation, factors influencing permeability of the blood-brain barrier (e.g. 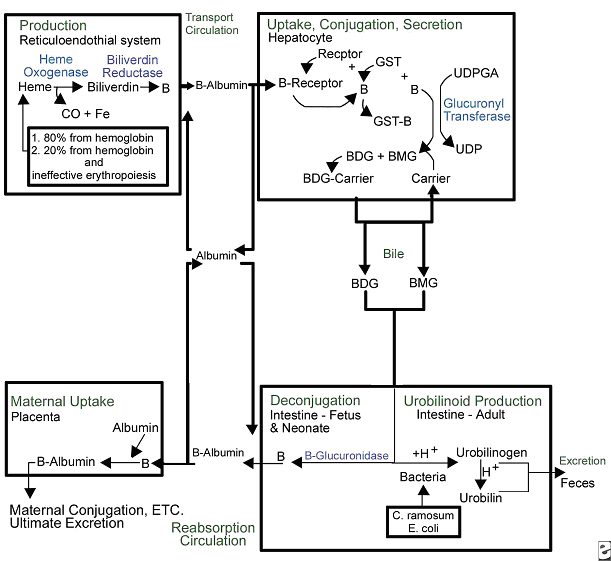 acidosis, infection) and the amount of unbound (versus albumin-bound) bilirubin may play a role. Improved brain imaging modalities, such as MRI and ultrasonography, may be emerging as instrumental tools to help clarify the complex picture of kernicterus in contrast with asymptomatic bilirubin staining of brain tissues. Bilirubin staining has been suggested to be visualized on MRI as an increased signal in the posteromedial aspect of the globus pallidus. Despite its theoretical value, however, efforts to use cranial imaging in the clinical setting have remained unsatisfying. This study reported, while all children with severe cerebral palsy and a history of hyperbilirubinemia had abnormal central gray matter on later scans, the characteristic central gray matter MRI features of kernicterus were not seen in early scans (6). Yellow staining of the basal ganglia in the brain of infants who died with severe jaundice and called it "kernicterus;"
Extreme hyperbilirubinemia causes bilirubin encephalopathy and toxicity to basal ganglia and brainstem nuclei. Acute manifestations: acute bilirubin encephalopathy. Kernicterus: chronic and permanent clinical sequelae of bilirubin toxicity. When assessing possible kernicterus, a history of risk for hemolytic disease can be an important clue to a neonate's increased risk of pathologic hyperbilirubinemia, particularly Rh antigen incompatibility between mother and baby (7). ABO incompatibility and a family history of red blood cell abnormalities (i.e. G6PD deficiency, hereditary spherocytosis) are also concerning. This study in Canada showed severe hyperbilirubinemia from 2002 – 2004 occurred in 34% of infants readmitted had one of these hematologic abnormalities (8). If the baby is breastfeeding well and appears healthy and vigorous, this can be reassuring. The mother may have breastfed previous babies who also developed significant jaundice. If so, she may be one of the approximately 20% - 40% of women who have above-average levels of beta-glucuronidase in their breast milk, which potentiates and prolongs hyperbilirubinemia in their breastfed babies. The clinical features of chronic bilirubin encephalopathy evolve slowly over the first several years of life in the affected infant. The clinical features can be divided into phases. The first phase occurs in the first year of life and consists of hypotonia, hyperreflexia, and delayed acquisition of motor milestones. The tonic neck reflex can also be observed. In children older than 1 year, the more familiar clinical features develop, which include abnormalities in the extrapyramidal, visual, and auditory systems. Minor intellectual deficits can also occur. Hematologic laboratory evaluation is the cornerstone of evaluation of the baby with hyperbilirubinemia. Although jaundice can be appreciated clinically, observation alone is not a reliable method to assess the severity or estimated risk factors for the infant. Total and Direct Bilirubin: Quantitative measurement of total and direct bilirubin levels should be undertaken in every baby at risk for significant hyperbilirubinemia or kernicterus. Total serum bilirubin measures the aggregate of all forms of bilirubin in the serum. Subtraction of the direct fraction from the total yields the calculated indirect bilirubin, or the conjugated form. The indirect fraction is composed of bound bilirubin, free bilirubin, and lumirubin, as well as many other clinically unidentifiable isomers if the baby is receiving phototherapy (9). Only the free bilirubin is available to cross the blood brain barrier and has potential to cause neurotoxicity; if and how the presence of other isomers modulates this process is unclear. Attempts to measure the amount of bound albumin or to estimate the bound fraction from measures of serum albumin have not proven to be clinically useful, although there has been some renewed interest in the clinical use of this tool (10). Serial measurements may be necessary to track the evolution of hyperbilirubinemia; frequency of measurement depends on the baby's gestational age, chronologic age, risk factors, and other clinical characteristics. In infants who were reported to the US kernicterus registry, total serum bilirubin levels ranged from 20.7 to 59.9 mg/dL at the time of presentation with the classic physical sings of kernicterus. A similar series of 249 infants in Cairo reported in this study had total serum bilirubin levels ranging from 25 to 76.4 mg/dL; at presentation, 44 infants (18%) had moderate or severe acute bilirubin encephalopathy (11). Blood Type: The baby's blood type should be determined and compared with that of the mother. Mothers with type O blood may have circulating antibodies to other red cell antigens and can cross the placenta and cause hemolytic disease in a baby with a different blood type, such as blood type A and B. Similarly, mothers who are Rh negative may have antibody to the Rh antigen if they have not been treated with RhoGAM. Minor antigens on the baby's RBC are also susceptible to immune-mediated hemolysis from maternally acquired antibody but usually to a lesser extent than the major antigens. Reticulocyte Count: Babies typically have reticulocytes counts higher than older infants and adults. However, significant elevation in the neonate's reticulocyte count (>7 mg/dL) can indicate the presence of an ongoing hemolytic process. Direct Coombs Test: This is the test assay for antibody on the RBC membrane. A positive result indicates that antibodies are attached to the RBC, placing it at risk for immune-mediated destruction. This is a quantitative test, so a positive result does not suggest the amount of antibody or the degree of hemolysis. However, pairing these results with the reticulocyte count can provide some idea of the sensitivity of the process. This test, although reliable, does not have 100% sensitivity. Because false-negative tests do occur, repeating a test with an initial negative result is not unreasonable if the clinical course supports an ongoing hemolytic process. In a many cases of ABO incompatibility, Direct Coombs Test findings may be negative. Therefore, an elution test should be performed to demonstrate anti-A or anti-B antibodies in the serum. CBC Count: A CBC with manual differential should always be included in the evaluation of a newborn with jaundice. Measurement of the hemoglobin and hematocrit can be helpful to determine if ongoing hemolysis is severe enough to cause anemia that is present. The peripheral smear inspection is particularly valuable because it may reveal large amounts of nucleated RBCs, suggesting active reticulosis; it may reveal abnormally shaped RBCs in the case of hereditary membrane defects such as spherocytosis and elliptocytosis or marked ovalocytosis in the case of hemolytic disease of newborn. Babies with sepsis can develop hyperbilirubinemia, and although not conclusive, normal total WBC count and manual differential can be reassuring in a healthy-appearing baby with hyperbilirubinemia. Serum Electrolytes: Breastfed babies are known to normally develop higher levels of serum bilirubin than their formula-fed counterparts. However, with the trend toward earlier discharge, most breastfed babies are being discharged home before breastfeeding is well established, and a concomitant increase in the number of infants readmitted to the hospital in the first week of life with hypernatremic dehydration has occurred. Many of these babies are also significantly hyperbilirubinemic. Therefore, assessing serum sodium, potassium, chloride, bicarbonate, BUN, and creatinine levels is essential; initiate treatment as appropriate. In regions where, cultural practice of newborn salting exists, assessing serum electrolytes is especially important as reports of severe hyperbilirubinemia, kernicterus, and death have been reported with serum sodium levels as high as 194 mEq/dL (12). Numerous devices that transcutaneously measure total bilirubin levels have become commercially available. These devices have been tested in babies of varying ethnicity, skin pigmentations, and gestational ages. Correlation with serum bilirubin is generally good. Although this approach is not recommended to replace the criterion standard of serum measurement, it may be useful adjunct to the clinical management of hyperbilirubinemia in the term and/or preterm infant. The high-risk zone is defined by the track of TcB values with positive likelihood ratio greater than 10, and the low-risk zone by the track of TcB values with negative likelihood ratio less than 0.1. 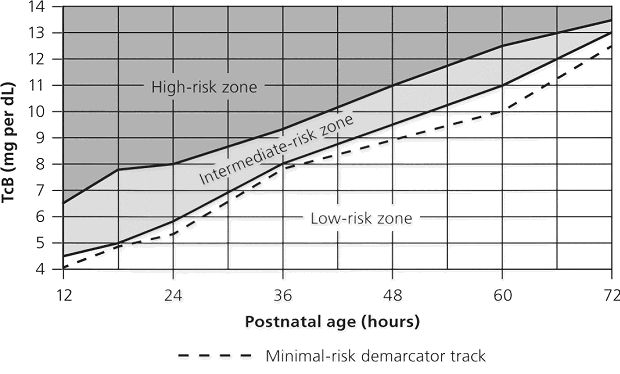 The minimal-risk demarcator track (negative likelihood ratio = 0) is also presented (See chart below). The nomogram was developed using 10,382 TcB measurements from 2,039 neonates with gestational ages of at least 35 weeks and birth weights of at least 2,000 g (4 lb., 7 oz) (14). Figure 2 Transcutaneous bilirubin (TcB) nomogram for assessing the risk of subsequent significant hyperbilirubinemia in healthy term and near-term newborns. In the initial evaluation of hyperbilirubinemia, sepsis should be included in the differential diagnosis (7)(13). If so, collection of spinal fluid for culture and cell count should be considered to rule out meningitis. If the baby is having neurologic symptoms, cerebral spinal fluid (CSF) evaluation is imperative; depending on the baby's symptoms, expanding the evaluation beyond the normal aerobic bacterial culture may be prudent. If on the other hand, the baby is vigorous and well-appearing with isolated hyperbilirubinemia as the only symptom (i.e. sepsis is not likely to be the cause of the hyperbilirubinemia), a spinal tap may not be necessary. G6PD deficiency is the most common enzyme deficiency in humans, with an estimated 400 million people affected worldwide (15). It is a well-known cause of severe neonatal jaundice; 21% of neonates listed in USA Kernicterus Registry had G6PD deficiency recognized (16). Because G6PD is in the hexose monophosphate pathway, which is the only nicotinamide adenine dinucleotide phosphate-generating process in mature erythrocyte, deficiency can lead to hemolytic disease. Acute hemolysis can occur in neonates with G6PD deficiency exposed to certain oxidant substances such as sulfonamide products, methylene blue, or naphthalene (15). Kernicterus associated with G6PD deficiency is not just a problem in the Far- and Middle-East but occurs in North America as well. The topic of routine neonatal screening for early detection of G6PD deficiency has recently been reviewed (17). The conclusion: there is no national consensus has emerged about the need for the routine newborn G6PD screening in the United States. High levels of total serum bilirubin (TSB) of 9.3 mg/dL at age 23 hours is well above the 95th percentile. First, if TSB is this high in the first day, then it should always be considered as the result of hemolysis, until proven otherwise, and G6PD deficiency should be checked and ruled out. Second, the poor response to phototherapy suggests hemolysis is present. Third, neonates with hemolytic jaundice are much more likely to develop a significant rebound after stopping phototherapy. For these reasons it is appropriate to obtain an outpatient TSB no later than 1 day after hospital discharge. In the acute phase of bilirubin encephalopathy, neuroimaging has no major diagnostic benefit. However, it can help rule out other diagnoses, particularly in the absence of profound hyperbilirubinemia. Head Ultrasonography (HUS): This modality is particularly well suited to the neonate because it is painless, portable, and non-invasive; also, the neonatal brain is easily imaged through the fontanelles. Ultrasonography is not helpful in diagnosing acute bacterial encephalopathy; however, other entities, such as intraventricular hemorrhage or parenchymal abnormalities, can be ruled out. CT Scanning: CT scanning has little place in the evaluation of the neonatal brain. The subtle abnormalities often present in the neonatal period are not well visualized by CT scanning, and false-negative findings are not uncommon. Magnetic Resonance Imaging (MRI): Previously, the neuronal damage characteristic of kernicterus was thought to only be identifiable on histologic examination postmortem. However, experience has revealed that MRI can be used to depict characteristic bilateral symmetric high-intensity signals in the globus pallidus on both T1-weighted and T2-weighted images in patients surviving with chronic bilirubin encephalopathy (see image below). The usefulness and cost-effectiveness of this modality in the diagnosis of more subtle forms of bilirubin-induced neurologic dysfunction (BIND) remains to be fully elucidated. Figure 5. 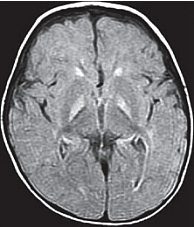 Magnetic resonance of 21-month-old with kernicterus. Area of abnormality is the symmetric high-intensity signal in the area of the globus pallidus (arrows). The changes in the globus pallidus were consistent with the deposition of unconjugated bilirubin and a complaint of abnormal movements in this patient. Because of the increased risk of hearing loss in infant with hyperbilirubinemia, a brain-stem evoked response examination was performed. This examination showed bilateral severe sensorineural hearing loss. The diagnosis of kernicterus was thus made. Brain-stem auditory evoked response (BAER): Hearing impediment is the most common sequela of bilirubin toxicity. Impairment may be subtle and may not be clinically apparent until the baby manifests delayed language acquisition. To maximize the baby's long-term neurologic functioning, early identification of any degree of hearing loss is important so that early developmental assessment and intervention can be initiated in a timely fashion. Serial assessments of hearing function may be necessary. With the advent of mandated universal newborn hearing screening, many newborn hearing screening programs contain specific protocols for infants with significant hyperbilirubinemia designed to identify early hearing loss. 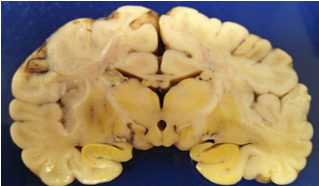 On macroscopic examinations, characteristic yellow staining can be readily observed in fresh or frozen sections of the brain obtained within 7-10 days after the initial bilirubin insult. The regions most commonly involved include the basal ganglia, particularly the globus pallidus and subthalamic nucleus; the hippocampus; the substantia nigra; cranial nerve nuclei, including the oculomotor, cochlear, and facial nerve nuclei; other brainstem nuclei, including the reticular formation and the inferior olivary nuclei; cerebellar nuclei, particularly the dentate; and the anterior horn cells of the spinal cord. 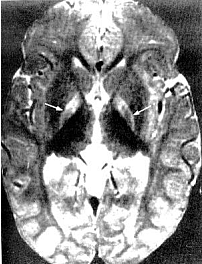 Neuronal necrosis occurs and results in the clinical findings consistent with chronic bilirubin encephalopathy. Histologically, this appears as cytoplasmic vacuolation, loss of Nissl substance, increased nuclear density with haziness to the nuclear membrane, and pyknotic nuclei (18). Figure 6. Kernicterus is shown on the coronal section of brain. (c) No eosinophilic staining nor spongiosis or vacuolation in the control cases in any the studied regions. The cornerstone of management of hyperbilirubinemia is prevention of neurotoxicity. The definitive method of removing bilirubin from the blood is via exchange transfusion. This is currently the indicated approach in the presence of clinical bilirubin-induced neurologic dysfunction (BIND) when the bilirubin level has reached dangerous levels despite preventive efforts. Phototherapy is the most common method aimed at prevention of bilirubin toxicity. Clinical research efforts evaluating the use of metalloporphyrins to block bilirubin formation by competing with the enzyme heme-oxygenase have not yielded a clinically useful intervention to date. No medications are available to treat the symptoms of acute or chronic bilirubin encephalopathy. Pharmacologic intervention is aimed at prevention. Current therapies are indicated as adjuncts to phototherapy when total bilirubin is approaching exchange levels; experimental therapy continues with the use of bilirubin production inhibitors. Because of ongoing pathology and equilibrium between the intravascular and extravascular spaces, having to repeat the procedure at least once is not uncommon. Using O negative blood rather than the baby's blood type is important because not all circulating antibodies may be removed. Packed RBCs resuspended in fresh frozen plasma must be used for this procedure. Irradiated RBCs are used to decrease the risk of graft-versus-host reaction. This procedure carries both inherent risks and iatrogenic ones and should be carefully performed. The reported overall mortality rate is about 3:1,000; the risk of significant morbidity has been reported at about 5:100. In babies who were very ill, the risk are higher. On series of 25 infants who were ill reported a mortality rate of 20% (21). As exchange transfusion is becoming an increasingly rare intervention, iatrogenic complications can be expected to increase. Administration of agar has been tried in an attempt to decrease the enterohepatic recirculation of conjugated bilirubin. It has not proved to be clinically useful and may cause intestinal obstruction. Parenteral administration of immunoglobulin G (IgG) has been shown in controlled clinical trials to reduce the need for exchange transfusion in both Rh and ABO immune-mediated hemolytic disease. Its mechanism of action is not entirely clear. Administration of glycerin suppositories to facilitate stooling has been evaluated as a potential method of ameliorating hyperbilirubinemia. Although a controlled trial demonstrated earlier passage of meconium, no effect was demonstrated on total serum bilirubin levels, except for a small statistically significant effect identified in males with blood type A positive. Whether this was a statistical aberration, or a true treatment effect is unclear. Enterohepatic recirculation and delayed stooling contribute to perpetuation of hyperbilirubinemia. Recent investigation has focused on the role of oligosaccharides (galactose and fructose) naturally occurring in breastmilk as a modulator of intestinal flora and function. As a result, major infant formula manufacturers are now adding these so-called prebiotics to their formulations. A randomized, double-blind trial of formula and prebiotics versus formula and maltodextrin placebo was examined the effect of the investigational formula on stooling frequency. For the first 28 days of life, 76 newborns were randomly assigned to receive one of the formulations. TcB measurements and number of stools per day were recorded. Infants in the prebiotic group showed significantly more stools per day for the duration of the trial period, as well as lower TcB levels (p<0.05) (22). L-aspartic acid and enzymatically hydrolyzed casein (EHC) are known inhibitors of beta-glucuronidase, the enzyme that promotes enterohepatic recirculation of conjugated bilirubin in the neonatal intestine. A randomized controlled trial of enteral administration of these substances (two treatment groups) compared with babies who received nothing (group three) or enteral whey/casein (no known enzymatic activity, group four) showed significantly lower TcB measurements in breastfed babies aged 3-7 days who received the enzyme inhibitors when compared with the controls (23). However, a similar treatment effect in group four raises some questions regarding the value of these therapies. Experimental therapy with Sn-mesoporphyrin inhibits bilirubin production by interfering with heme-oxygenase, an essential enzyme in the catabolic pathway of hemoglobin. This therapy is in clinical trials but has not been approved for use by the Food and Drug Administration (FDA). A report of a single case of compassionate use in the United States in a very low birth weight infant with severe growth restriction who was not a candidate for exchange transfusion showed a more than 25% reduction in TSB levels after administration of a single dose at 46 hours of life (24). Although more extensively studied in other countries, the safety and possible long-term sequelae of this therapeutic modality remain to be elucidated. Depending on the degree of neurologic impairment, infants or children may have limitations in their ability to eat normally. Diet and nutrition must be individualized with the help of the neurodevelopmental team caring for the patient. Some neurologic deficits typically appear during the phase of motor skill acquisition by the infant. Motor deficits should be identified early, and appropriate intervention should be initiated to maximize the infant's ability in this critical area. Stable central venous access is required to successfully perform an exchange transfusion. Surgical placement of appropriate lines may be required to facilitate this procedure if a catheter cannot be placed into the umbilical vein. No medications are available to treat the symptoms of acute or chronic bilirubin encephalopathy. Pharmacologic intervention is aimed at prevention. Current therapies are indicated as adjuncts to phototherapy when total bilirubin is approaching exchange level; experimental therapy continues with the use of bilirubin production inhibitors. Blood product derivatives decrease the amount of free bilirubin in the intravascular space, thus theoretically reducing risk of neurotoxicity. Bilirubin is produced via induction of its enzymatic pathway and by RBC degradation. Inhibition of either of those two mechanisms can decrease the amount of bilirubin in the blood. Because bilirubin bound to albumin is not available to cross the blood-brain barrier, increasing the amount of serum albumin theoretically increases the amount of available binding sites and decreases free bilirubin. Efforts to quantify albumin-binding capacity or serum levels of bound bilirubin have not proved to be clinically useful, although assessment of the bilirubin-to-albumin ratio has recently been incorporated into the decision-making algorithm for exchange transfusion. However, administration of albumin for the purpose of increasing bilirubin-binding capacity is not a recommended standard of care. It may be considered in cases of significant hypoalbuminemia. Measured albumin levels <3 g/dL may be considered an additional risk factor for BIND when considering therapeutic interventions. Dosage forms and strengths: injectable solutions – 50 mg/mL (5%); 250 mg/mL (25%). Choice of 5% vs 25% depends on whether patient requires primarily volume (5%) or primarily protein/oncotic pressure (25%). Usual dosage guidelines: neonates (<28 days old) / infants: 10-20 mL/kg IV of 5% solution; 500 - 1,000 mg/kg IV infusion (NOT to exceed 250 g/48 hours or 6 g/kg/day). Adverse effects: anaphylaxis, congestive heart failure, edema, hypertension or hypotension, hypervolemia, tachycardia, bronchospasm, pulmonary edema, salt and water retention, chills, fever, headache, nausea or vomiting, pruritis, rash, urticaria. Parenteral administration has been shown in controlled clinical trials to reduce the need for exchange transfusion in both Rh and ABO immune-mediated hemolytic disease. Its mechanism of action is not entirely clear. Administration in hyperbilirubinemia resulting from isoimmune hemolytic disease that is unresponsive to phototherapy and/or is approaching exchange level has been recommended by the AAP in its 2004 revised clinical practice guideline. Dosage, forms and strengths: injectable solutions - 100 mg/mL (10%); 50 mg/mL (5%). Pediatric HIV, prevention of infection: 400 mg/kg IV q2-4 hour. Primary Immunodeficiency Syndrome: Flebogama, Gammagard S/D, Gammagard Liquid - >2 years of age 300 - 600 mg/kg IV q3-4 week. Gammagard Liquid (SC administration): <2 years - safety and efficacy not established; 2-16 years (conversion from IV): previous IV dose/week X 1.53/IV dosing interval (in weeks); Infusion rate <40 kg: 15 mL/hour/site initially, may increase to 15-20 mL/hour/site (volume not to exceed 20 mL/site); Infusion rate 40 kg or greater: 20 mL/hour/site, may increase 20-30 mL/hour/site (volume not to exceed 20 mL/site). Adverse effects: chills, headache, generalized pain, hypotension, anaphylaxis related to infusion rate, aseptic meningitis syndrome. Phenobarbital may increase hepatic conjugation and excretion. Decreased hepatic conjugation caused by normal delay in enzyme induction increases the amount of unconjugated bilirubin in the blood stream. Conjugated bilirubin does not pose a threat of neurotoxicity. Once conjugated, this nontoxic form of bilirubin proceeds toward intestinal excretion. Induced the hepatic enzymes involved in bilirubin conjugation and increases biliary excretion. DO NOT administer intra-arterially. Dosing can be enteral or parenteral. Dosage forms and strengths: tablets - 15 mg, 16 mg, 30 mg, 32 mg, 60 mg, 64.8 mg, 65 mg, and 100 mg. Elixir: schedule IV - 20 mg/5mL Injectable solution - schedule IV: 30 mg/mL, 60 mg/mL, 65mg/mL, 130 mg/mL. Status epilepticus: infants and children - 15-20 mg/kg IV infused at a rate not to exceed 2 mg/kg/min; not to exceed 1,000 mg/dose. <60 kg: IV rate at <30 mg/min May repeat with 5-10 mg/kg bolus dose after 15-30 min prn; not to exceed cumulative dose of 40 mg/kg. Sedation: 2 mg/kg by mouth three times a day Hyperbilirubinemia (Off-label): neonates - 5 mg/kg/day by mouth/IV q Day, or divided q12hour for 3-6 days following birth. <12 years (chronic cholestasis): 1.5 - 4 mg/kg by mouth q12hour. Adverse effects: respiratory depression (more common with IV dosing), ataxia, dizziness, drowsiness, dysarthria, fatigue, headache, irritability, nystagmus, paresthesia restlessness, vertigo, paradoxical excitement or hyperactivity. Less common: mental illness, constipation, diarrhea, nausea, vomiting and megaloblastic (folate-deficiency anemia. Rarely: Steven-Johnson syndrome, rickets and Osteomalacia. Obtaining input from a pediatric neurologist during the acute presentation of BIND may be useful. However, the history and clinical presentation may make the diagnosis and clinical presentation may make the diagnosis apparent. In the chronic phase, involving neurodevelopmental specialists in the care and evaluation of the infant is important. Developmental potential can be maximized by early identification of and intervention for neurologic deficits (19),(25). If the patient develops hydrocephalus, consultation with a neurosurgeon is recommended. Phototherapy induces a conformational change in the bilirubin molecule, rendering it water-soluble. Formation of lumirubin is irreversible, whereas the formation of other water-soluble isomers is reversible upon cessation of phototherapy. Post-phototherapy rebound is a well-recognized phenomenon that must be considered in all patients receiving phototherapy for hyperbilirubinemia due to a hemolytic process or prematurity (26). Risk factors of excessive rebound included a positive direct Coombs test and a gestation less than 37 weeks. Prevention of hyperbilirubinemia is the best way to minimize the incidence of kernicterus. However, because some babies develop kernicterus with relatively modest bilirubin levels, no known absolute level of bilirubin below which the infant is completely safe is recognized. Additionally, because other factors contribute to the ability of bilirubin to cross the blood-brain barrier, management of these components must be appropriately considered. Good follow up and check bilirubin levels. Any infant at risk for significant hyperbilirubinemia and possible neurotoxicity should be cared for in a nursery capable of rendering appropriate care for the hyperbilirubinemia and any contributing diagnoses. A published nomogram predicts which babies may be at risk for significant disease, based on hour-of-life-specific bilirubin levels (27). Infants whose levels fall in the high-intermediate and high-risk zones should be closely monitored in a nursery capable of caring for sick newborns; they may require transfer from the birth hospital to a regional perinatal center. An evidence-based standard care pathway for neonatal jaundice can significantly improve multiple dimensions of value, including reductions in cost and length of stay (28). The standardized development tools and processes here are transferable to other institutions. High-value care for patients with neonatal jaundice can therefore be optimized for patients in large referral region, nationally and worldwide. The numerous areas of uncertainty surrounding the diagnosis and treatment of hyperbilirubinemia in the infant, coupled with the infrequency of sequelae, make it easy to become cavalier about the evaluation of infant with jaundice. However, the physiologic hyperbilirubinemia is a diagnosis of exclusion, and kernicterus, when it occurs, is a devastating and legally indefensible sequela. Sepsis must always be excluded in the infant with jaundice. Uncommon, but treatable, metabolic causes include hypothyroidism and galactosemia. The first sign of occult immune or nonimmune hemolytic disease may be hyperbilirubinemia. Recommendations are based on infant's age (in hours of life) at discharge, presence or absence of risk factors for exaggerated hyperbilirubinemia, and the presence of other neonatal problems. Recommendations for follow-up range from as early as prior to 72 hours of life (if discharged before 24 hours) to no later than 120 hours (5 days) if discharged before 72 hours.